It's hard to believe Andre the Giant died 20 years ago today (January 27th). I often wonder what his role in wrestling would be today had he lived. He was only 46 years old when he died, and although his body was broken down even years before his death, I would like to think that Andre could have had some sort of role today. At least making special appearances like the other Hall of Famers and Legends still do from time to time. The first memory I have of Andre had to be in 1982 or 83, I wasn't even a wrestling fan at that time. My dad and brother watched all the time. I remember seeing Andre beating the hell out of Nikolai Volkoff. I don't think this was WWF, but I'm not sure. Andre was even using a chair at one point. Now remember, I was only 8 or 9 years old when I was seeing this, and remember thinking Andre needed to stop, or this assault would surely lead us to war with the Russians. (Tensions between the USA and USSR were running rampant) And this was before John Stossel's expose on wrestling on ABC's 20/20 program. So I was under the impression that everything I was watching was legit. I never got a chance to see Andre wrestle in person. My brother and dad saw a match between the Giant and King Kong Bruiser Brody at the Kiel Auditorium in St. Louis. This had to be sometime in '83. My brother tells me it was a wild fight that ended in a double disqualification. A couple years later when I saw Brody wrestle in person, I understood how things could get out of hand. Outside of Hulk Hogan, I believe that Andre the Giant was probably the most recognizable wrestler from the 1980's. I think even nearly two decades after his death, if you showed non wrestling fans a picture of him, they would be able to identify him. Even my kids who are pretty young know who Andre is. That's in part due to the fact that I have the Legends action figure of Andre on my desk at work. I've had it since 1997, so it's been around longer than they have. As I mentioned I never got to see the Giant live in person. Just some of the memorabilia from his career, including the hand prints. As you can see they were huge. 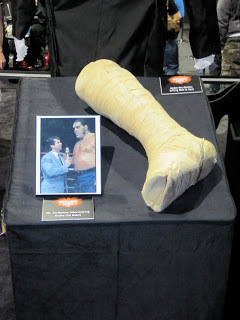 At Axxess in 2010, we also got to see some more artifacts, although I can't figure out why they saved his leg cast after an in ring accident against Killer Khan in 1981. For fans who weren't around in the 70's and 80's to see Andre in action, Hulk Hogan isn't the first people to slam the Giant as the WWF wanted us all to believe after Wrestlemania 3. Although as a kid, seeing that moment I felt like I was a part of history. It's still in my opinion one of the most defining moments in Wrestlemania history. But I was able to find a page showing the Giant being slammed through the years. Some of the guys I knew had done it, but others I wasn't aware of, specifically Butcher Vachon and the star out of Mexico. Despite the slams though, to the best of my memory Hulk Hogan and the Ultimate Warrior are the only two wrestlers to pin the big man. Someone correct me if I'm wrong. Even though I didn't become a wrestling fan until the twilight of Andre's career, I still believe he had a huge (no pun intended) impact on the business that is still felt today. RIP Andre.